St. Vincent de Paul ministers to those in need. In a confidential manner, all members of the community who require assistance are provided food, housing, clothing and other necessities to maintain a dignified existence. Clothing drives are organized in the fall and the spring. The Adopt-a-Family program provides food and gifts for approximately 100 families each Christmas. St Mary of Gostyn Food Pantry hours are from 8:00am until 11:00am every Wednesday. We serve Downers Grove residents only; with one exception. There are no boundaries for St Mary’s parishioners needing assistance. 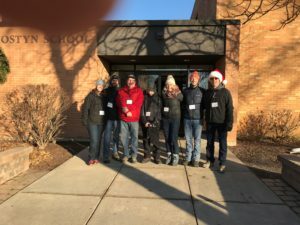 The mission of SMG’s St. Vincent DePaul Society includes projects like the Food Pantry, Home Visits, Outreach Ministry, Clothing Drives and the Christmas Adopt-A-Family program. This year the SVDP Adopt-A-Family program sponsored a total of 91 families. We want to thank all our volunteers and everyone that sponsored a family! You really made a difference and brought joy to the 335 individuals that benefited from your generosity. St. Vincent DePaul members enjoy spending time together and helping those in need. Please consider attending one of our meetings held every other Saturday at 9:00 am in the Parish Center. Our next meeting is February 24th. You can help as much or as little as your schedule allows. Come join us, we are excited to meet you!